In order to stay on track and ensure that you hit every corner of the house, you should make a checklist of everything that needs to get done before even starting. This can help you formulate your game plan, and delegate jobs amongst your family. Plus, as you complete more and more tasks, you’ll have the satisfaction of seeing your checklist shrink right before your eyes. Some tasks that often get forgotten, include dusting light bulbs, cleaning lightbulbs, and wiping down windows (both inside and out). There’s nothing worse than gearing yourself up to finally clean those windows upstairs and realizing you’re fresh out of window cleaner. Be sure to stock up on all the supplies you’ll need, including all-purpose and window cleaner, sponges and scrub brushes, a clean mom, and specialty products that may be needed to remove mildew and rust from bathroom tiles and sinks. Going from room to room while you’re cleaning is a sure fire way to get distracted and miss important tasks. Stick to one room, and clean it from one end to the other, top-to-bottom before moving on to the next. You’ll also experience a big sense of satisfaction a lot quicker when you get to check an entire room off your list! 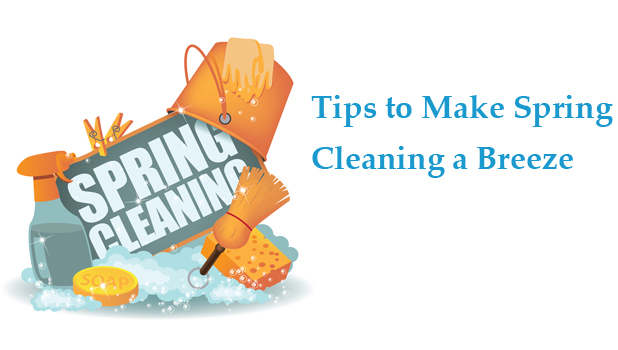 Spring cleaning doesn’t have to be a gruelling 12-hour marathon of mopping and scrubbing. Spread your to-do list out over a few days to divide up the workload. It might take a bit longer, but you’ll be a lot less overwhelmed and will most likely do a better job cleaning because of it! If you are going to be tackling the majority of your cleaning over one period of time, don’t forget to set a timer and allow yourself 10-15 minute breaks.